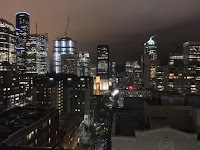 Tuesday Evening - This morning, we walked down to Pike's Market for a little bit of sightseeing but it was pretty crowded probably due to the Christmas season. We met up with some friends from Fairbanks, who happened to also be in Seattle for medical reasons, for coffee. At Tully's not Starbucks. We then headed to Pacific Place for lunch and I needed a place to sit still for a couple hours for an audio conference. I think I found the only bench in the mall. 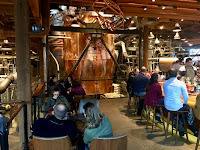 After my audio conference, we walked up the hill to the Starbucks Tasting Room on the corner of Pike and Minor. It was crowded, loud and it didn't smell like they were roasting any coffee at that time. I must admit to not being too impressed with the place. So after looking around for a bit, we then headed back to the hotel for some rest. 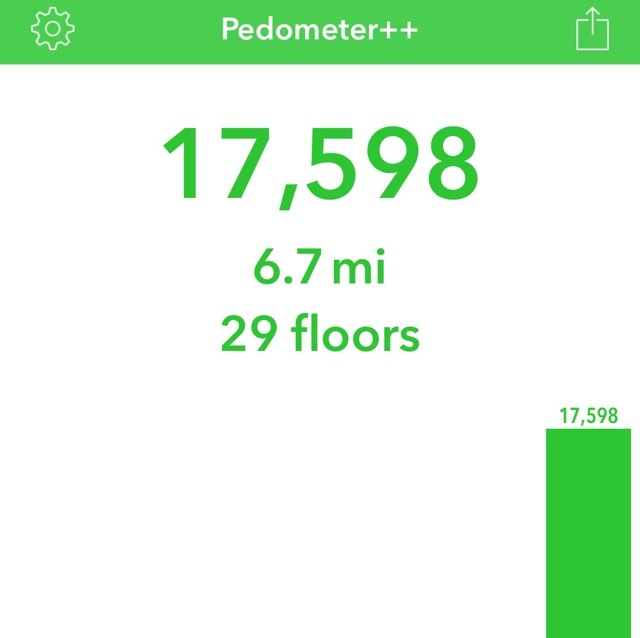 These hills give you quite a workout. 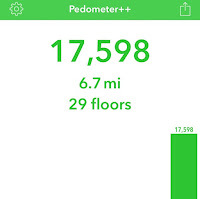 My Pedometer+ app claimed 21 floors so far today but only 3.6 miles so far. Very cloudy, gloomy that night. From what I'm told, typical Seattle. 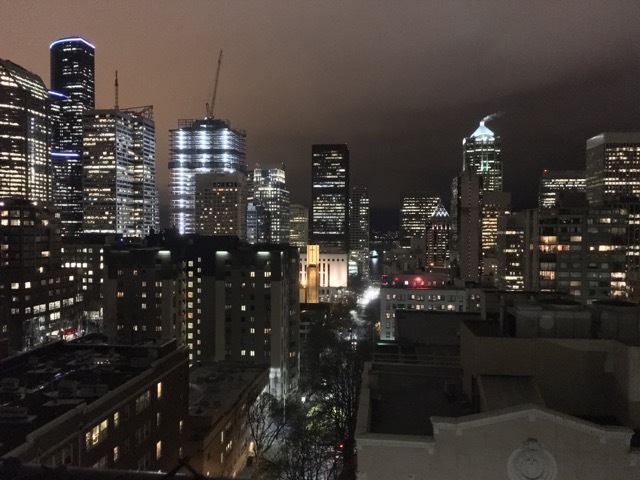 Seattle is a good city for your everyday workout. Hope that the health issues will be dealt with according to plan and things are going to be well, Richard. I love Seattle but just like you, it's killer to walk around those hills. I've done it on plenty of visits. 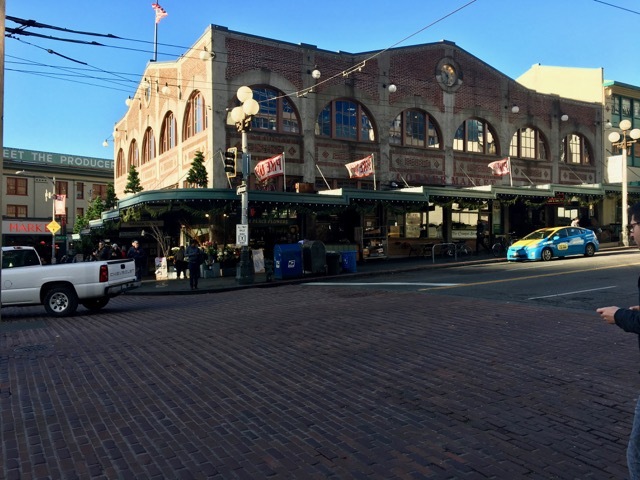 And I don't care what day, what time of year, Pike Place is always packed. I found a cute coffee shop with delicious Chai Tea Lattes in the basement in the middle of Bubble Gum Alley. I hope you saw that. WOW! Thank you for stopping by and commenting! I was not aware of the hills as the only times I've stayed here in the past were short visits to specific places. Not much wandering around. Sounds like you are really getting your exercise. 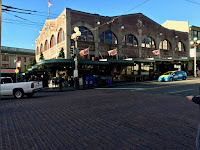 We'v been to Tully's there by PIke's Place and they are pretty tasty. Not as busy as the original SB is there. Good luck with the procedure today and Happy Birthday to Bridget. Starbucks was a zoo, plus the Tully's coffee didn't taste over roasted like Starbucks. I think the procedure went fine but I'm on strong pain meds now. 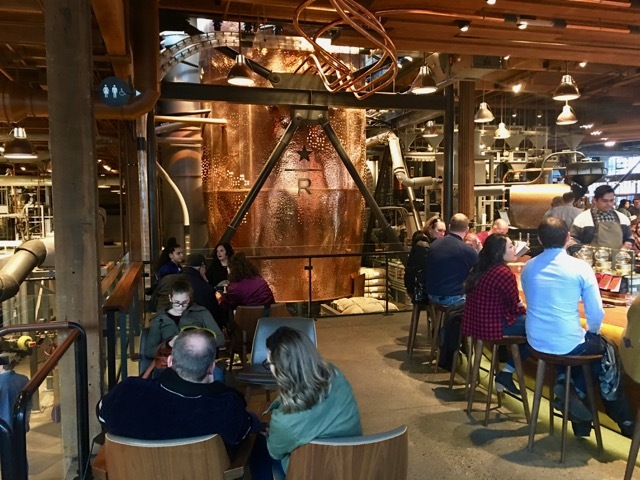 Like you, I might not Love Starbucks... but look at that Gorgeous Copper!! Hope the reasons you are there are corrected quickly. There really was a lot of copper in that room. And thank you for the well wishes.